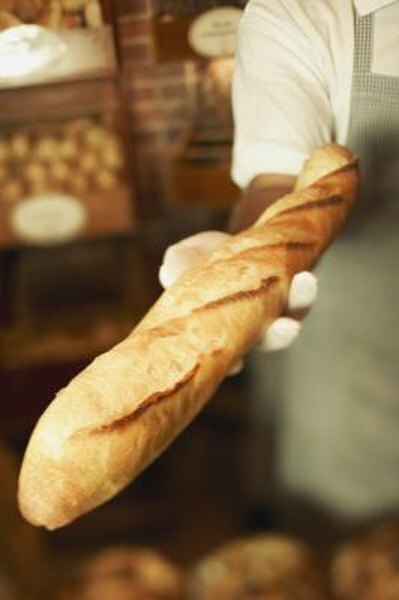 Baguettes have long been a source of pride in France -- only baguettes prepared using traditional baking methods may be deemed "the bread of French tradition." French bakeries and grocery stores make baguettes in the U.S., and not all of them use artisanal baking methods, but most loaves have the crispy crust and savory and sweet internal flavor the bread is known for. French bread provides a variety of culinary uses and some healthful nutrients. A 6-inch baguette piece provides 277 calories of energy, which is approximately 14 percent of the standard 2,000-calorie diet. A sandwich with a baguette, lean cold cuts, cheese, vegetables and dressing provides a healthful lunch, or serve it alongside French onion soup for an authentic French meal. Substituting a baguette for regular refined wheat bread may be a luxury depending on the rest of your diet. Two bread slices provide half of the calories compared to the baguette. A baguette serving provides 11.3 grams of protein, 1.8 grams of fat. It also contains 54.2 grams of carbohydrates, including 2.3 grams of dietary fiber, which improves digestion and helps regulate your blood sugar after a meal. The other carbohydrates in baguettes provide energy, including glucose -- the preferred source of fuel for your muscle and brain tissue. The 3.5 milligrams of iron, 26 micrograms of selenium, 109 milligrams phosphorus and 142 micrograms of folic acid a baguette provides helps support several biological processes of the human body. Iron plays a central role in healthy oxygen circulation, but many women don't consume enough iron in their diets. Selenium protects healthy cells from harmful effects of metabolic waste that sometimes accumulates in the body and causes disease and premature aging, while phosphorus makes up your bones and teeth. Women who may become pregnant need folic acid for preventing birth defects and supporting DNA development. One drawback of eating French bread is the sodium content, which would quickly accumulate if you consume more than one serving -- a tempting prospect considering that a baguette stays fresh for about one day. A 6-inch serving provides 492 milligrams of sodium, or one-third of the recommended upper daily intake of 1,500 milligrams. A high level of sodium can compromise healthy blood pressure, contribute to heart disease and cause dehydration. What Vitamin Is Good for Kidneys? What Are the Benefits of Eating Baked Potatoes? Why Is Vitamin B Important? What Is the Nutritional Value of an Acorn Squash?